Hathikan is basically a tropical plant found growing as common undergrowth in secondary and disturbed evergreen forests in Indimalaya, Indochina, Australia and pacific islands. In India, it can be seen growing throughout the hotter parts from the tropical Himalaya, Bengal, Assam and the Western Peninsula. 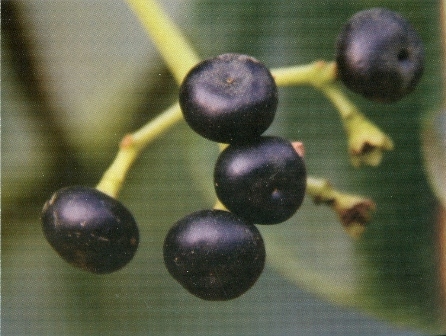 The hathikan bears edible fruits, but it is known more its medicinal value. 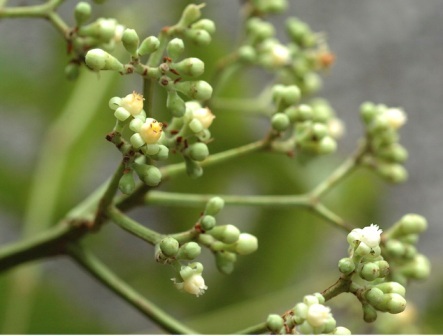 Hathikani plants are frequently planted by physicians of Indian systems of medicine. Hathikan literally means ears of elephant. This name seems to have been assigned to this plant because of its large leaves. Shrubs to 2 m high; young branches, rachises, petioles, petiolules and inflorescences hairy to mealy-pubescent. Leaves alternate, 1 or 3-foliolate or 1-3 pinnate; if 1 or 3-foliolate; petioles to 20 cm long; rachises 10-15 cm long; stipules obovate, 2-6 x 1-4 cm; leaflets oblique, broadly ovate, oblong-ovate, elliptic or rhomboid, 15-60 x 10-50 cm, cordate at base, acute or short acuminate at apex; if 1-3 pinnate leaflets 7-21 or more, oblong, ovate-lanceolate or elliptic, 9-30 x 4-9 cm, rounded at base, serrate at margin, acuminate to caudate at apex, chartaceous to subcoriaceous, glabrous to sparsely hairy above, sparsely to densely hairy sometimes mealy-pubescent beneath; lateral nerves to 14 pairs, pubescent to hairy; petiolules to 25 mm long. Inflorescences 12-45 cm long, much branched; peduncles to 25 cm long; bracts deltoid to narrowly 3-angled, to 6 mm long; pedicels 1-2 mm long, pubescent; flowers greenish white. Calyx 1.5-3 x 2.5-4 mm, 5-lobed, mealy-pubescent; lobes 3-angled, 0.75-1 x 0.8-1 mm. Corolla tube with staminal lobes 3-4 mm long; corolla lobes 5, linear-ovate, thick, 2-4 x 0.8-1 mm, greyish-pubescent to papillose. Staminal lobes slightly retuse or shallowly cleft; stamens free, in between staminal lobes; staminal column 2-3 mm long; filaments ca 1 mm long; anthers oblong, ca 1 mm long, medifixed. Ovary globose, 1-1.5 mm, 6-loculed; style to 2 mm long. Fruits subglobose or globose-depressed, 10-15 mm across, green; seeds usually 6, 3-gonous, ca 4 x 3 mm. Hathikan fruits are edible and are frequently eaten by children and villagers. These are, however, not offered for sale. 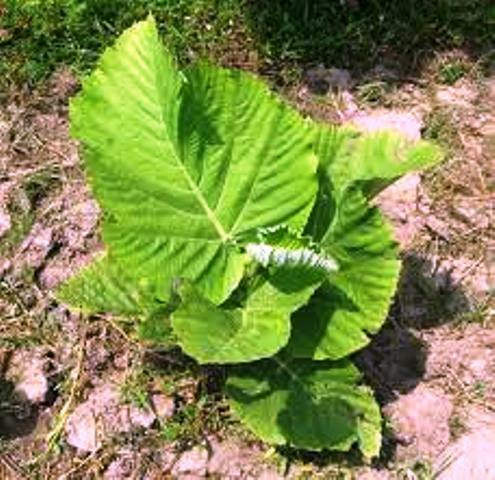 Leaves of this plant are used a vegetables. Often disposable plates for serving food in feasts villages is also made by joining a few leaves together . The tuberous roots are astringent and alexipharmac; used to kill guineaworm, and when pounded is applied to obstinate sores to promote cicatrisation. It is applied externally to allay pain and to stop the effusion of blood. Hathikan plants are planted in medicinal garden by physicians for their own use. New plants can be raised from seed.